November 19, 2017 at 2:51 pm. The Oklahoma quarterback apologized after his offseason arrest in Arkansas. He apologized after planting an OU flag at midfield after the Sooners won at Ohio State early in the season. He apologized after a crotch-grabbing, curse-spewing sideline rant Saturday that apparently was so offending to delicate eyes that ESPN had to blur out his hand gestures and cover his mouth. “I am a competitive player, but what I did was disrespectful and I apologize,” Mayfield said after the Sooners steamrolled Kansas on Saturday. Three is a pattern, and Mayfield’s pattern makes him a target for anyone who wants to hate on the nation’s best player. Let’s set the disorderly conduct/resisting arrest thing aside. That was serious. That’s in a different category. But everyone has to be honest here. The flag-planting. The trash-talking. The brashness. Even the crotch-grabbing. That’s not a bug, that’s a feature, and you would kill to have Baker Mayfield on your team. With his antics, he might lose a Heisman vote here and there. Big whoop. Too late. He’s at the Heisman 5-yard line, nobody around him, ready to Gronk-spike the football in the end zone. You know who really won’t care about what ended up being the biggest topic on a lazy college football Saturday? The NFL. The scouts L-O-V-E Mayfield’s competitive drive. That’s part of what makes Mayfield, Mayfield. The questions about his draft status — which will be fascinating — will then be determined by some sort of calculus after scouts input arm strength, 40 time, height, ad-lib skills, football IQ and ability to transition from a college spread offense. Is he a first-rounder? A mid-rounder? Merely a college freak playing in the no-defense Big 12? No apology needed for his production. Mayfield is the most efficient quarterback of the spread era, one of the greatest college football stories of the generation — a two-time walk-on, at Texas Tech and Oklahoma, who is certain to win a Heisman and maybe even a national championship. Mayfield’s emotions were summoned more strongly Saturday at Kansas, when three Jayhawks players refused to shake his hand at the midfield coin toss and then proceeded to deliver a couple of late cheap shots during the game. Mayfield’s fiery streak makes him a “character.” Any sport needs characters. But has he shown a lack of character? His on-field extracurricular stuff is a bit overblown in this camera-always-on-you age. It’s up to him now to rein in the moxie just enough to avoid becoming a full-blown knucklehead. 1. Wisconsin is CFP worthy. Sometimes, the selection committee talks about “good wins” or “bad losses” or “game control.” Well, the Badgers don’t have many good wins, have no losses at all, but they are the kings of game control, not trailing in the fourth quarter all season. They took Michigan apart piece by piece in the second half Saturday. 2. Watch out for Oregon. The Ducks are a completely different team with sophomore quarterback Justin Herbert, who was back Saturday to lead a victory over Arizona after missing five games because of a collarbone injury. The Ducks were 1-4 in the games without Herbert, averaging just 15 points. Herbert will be one of the nation’s best quarterbacks next season for coach Willie Taggart, who will be in his second year. 3. Josh Rosen vs. Sam Darnold was quite a show. Scouts were riveted to USC-UCLA to see which flavor of quarterback they might prefer — the Trojans’ Darnold or the Bruins’ Rosen. Rosen is more pocket-ready right now, with the arm to beat tight NFL coverage. Darnold is more of an all-around playmaker with better mobility. Each has too often forced the issue this season, resulting in turnovers. Best guess if both come out: Rosen is taken before Darnold. 4. Anybody paying attention to Missouri? The Tigers have won five in a row to get bowl eligible after a 1-5 start, stomping three consecutive SEC foes — Florida, Tennessee and Vanderbilt — by a combined 140-50. They could deal Arkansas coach Bret Bielema a final indignity Friday when they go to Fayetteville, Ark. 5. We have a college football playoff bracket. No, not yet in the FBS. But the Football Championship Subdivision is ready for the postseason, releasing its 24-team bracket Sunday. Defending champ James Madison is the No. 1 overall seed, with North Dakota State — which won it all for five consecutive years from 2011 to 2015 — as the No. 2, setting up a potentially huge matchup in the title game. 1. UCF’s Scott Frost. Nebraska fans want him back in Lincoln so badly that some fans in Philadelphia — at the Knights’ game against Temple on Saturday — held up signs that spelled out, “Scott, come back home” for him to see as he left the field following his team’s 10-0 start. Frost then issued the standard non-denial denial when addressing reports that he will be replacing Mike Riley. 2. FAU’s Lane Kiffin. The rehabilitation of Kiffin is such that he would be a great choice at Tennessee, if he hadn’t already been there, done that, left the Vols holding the bag. The high-scoring Owls have ripped off seven consecutive wins in Kiffin’s first season and will host the Conference USA title game against North Texas. 3. Memphis’ Mike Norvell. He already has 17 wins in not-quite two seasons with the always-entertaining Tigers and has this year’s team in the College Football Playoff rankings. Memphis could win its way into an American Athletic Conference championship and a New Year’s Six bowl game. 4. North Texas’ Seth Littrell. It’s gone a bit under the radar, but the Air Raid disciple, who took over a 1-11 program after the 2015 season, has the Mean Green at 8-3, earning a berth against Kiffin’s Florida Atlantic squad for the Conference USA championship. 5. Toledo’s Jason Candle. Candle is another young head coach (38) who knows offense — don’t ignore what Rockets QB Logan Woodside is doing this season. Candle has compiled an 18-6 record in two seasons in Matt Campbell’s wake, plus he already has proven he is a top recruiter. 1. 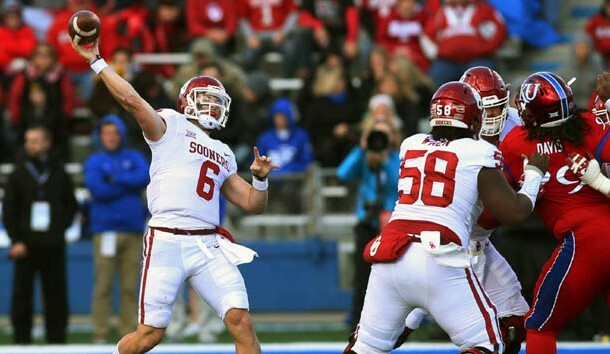 Oklahoma QB Baker Mayfield — He set an FBS record last season with a passing efficiency rating of 196.4. He is at 199.3 this year. 2. Stanford RB Bryce Love — He had a substandard night against Cal, but he managed to rip off a 57-yard TD run, his 11th consecutive game with a rush of 50-plus yards and setting the FBS record with 11 rushes of 50 or more yards in the same season. 3. Louisville QB Lamar Jackson — Seven Heisman winners have returned to school since 2003. None finished higher than third in their bid to repeat. 4. Wisconsin RB Jonathan Taylor — He wasn’t a five-star recruiting lock. In fact, he came to camp this fall with coaches looking at a potential redshirt year. And now, this: 1,657 rushing yards, combining size with patient running and great vision. 5. Arizona QB Khalil Tate — We get it: Penn State RB Saquon Barkley is going to get an invite to New York City, but we’re sticking with Tate. Even with a rough night in a loss at Oregon, the out-of-nowhere sophomore has put together perhaps the freakiest highlight tape in college football this season. 1. Alabama at Auburn (Saturday, 3:30 p.m. ET) — An epic Iron Bowl matchup. Can No. 1 Alabama still make the College Football Playoff with a loss? Of course, it’s Alabama! Calling early shot: Tigers with the upset. 2. Ohio State at Michigan (noon ET) — The Big Ten East has already been decided — the Buckeyes will play West champ Wisconsin — but this great rivalry has stakes a’plenty: Ohio State still harbors playoff hopes and Michigan’s Jim Harbaugh needs to not go 0-3 vs. Urban Meyer. 3. Washington State at Washington (Saturday, 8 p.m. ET) — The Huskies can’t win the Pac-12 North, but they can earn a second straight 10-win season by winning the Apple Cup. Washington State is the division champ with a victory; Stanford goes to league title game if Washington wins. 4. Notre Dame at Stanford (Saturday, 8 p.m. ET) — The Cardinal will be scoreboard watching what happens in Seattle; Notre Dame needs this final notch to earn an at-large berth in a New Year’s Six bowl. 5. South Florida at Central Florida (Friday, 3:30 p.m. ET) — The two best Group of Five teams all season meet in what should be a riveting shootout.